Japanese Episode AG 043: "Tobe Tatsubei! Ashita ni Mukatte!!" American Episode 315: "Let Bagons Be Bagons"
The gang is traveling to Hajitsuge Town when they come across a Tatsubei. The pokemon keeps jumping off a cliff, and Satoshi and his friends think that the pokemon is challenging them. The pokemon's trainer, Michelle, arrives and tells the gang off for attacking her Tatsubei, but soon she realizes that they had mistaken Tatsubei's intentions. She tells the group that she thinks her Tatsubei keeps jumping off the cliff because it's trying to teach itself how to fly. Takeshi remembers that the pokemon will eventually evolve into Bormander, meaning that if it gets enough experience, it will evolve into a pokemon that actually can fly. So, Satoshi decides to help the pokemon gain some experience by battling it. However, during the battle, the Rocket-Dan appear to scoop up the Tatsubei! 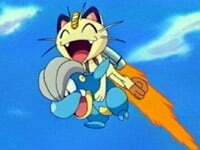 Nyasu, wearing a jet pack, swoops down and nabs the pokemon, but the Rocket-Dan lose control of Nyasu's rockets when they drop the remote control. Musashi and Kojirou have to scramble after Nyasu by helicopter while Satoshi, Michelle, and the others follow on foot. Everyone eventually meets up in a forest, where the Rocket-Dan kidnap Pikachu and escape in their helicopter. Kimori and Tatsubei, wearing Nyasu's rocket pack, follow the trio and quickly bring the helicopter crashing down to earth. The Rocket-Dan is defeated! Suddenly, Tatsubei begins to glow, and everyone looks excitedly as Tatsubei evolves into Komoruu! Michelle's pokemon, now one step closer to achieving its goal, goes off with Michelle to continue training as Satoshi and his friends get back on the road to Haruka's next Pokemon Contest. Eh, I didn't really like this episode all that much. The plot seemed like a familiar Jouto plot, and the character-of-the-day wasn't memorable at all. I did like the art in the Boss Fantasies, though, but everything else was just "meh." The dubbed version is, as usual, very average edit-wise. I didn't really care for Michelle's dubbed voice, but everything else in the episode was of the usual quality. Amazingly, there isn't a single time cut in the episode until about halfway through the episode. In the Japanese version, the main commercial break occurs about halfway through the battle between Satoshi and Michelle. We see the footage of the two fighting, the show goes to commercial, and then we see eight seconds of the battle repeated. 4Kids cut one of these repeated scenes so that it only plays once in the dub. Two seconds are cut from the scene after Kids' WB! 's final commercial break. AND...there aren't any cuts to the TO BE CONTINUED... screen!